Welcome to Future Power Generation, Inc.
Future Power Generation promotes geothermal energy solutions in particular and alternative, renewable energy creation in general in order to mitigate energy risks and dependencies on non renewable fossil and nuclear energy solutions. Geothermal energy describes the energy that is stored deep inside of our planet. This is one of the sources Future Power Generation are aiming for. Geothermal power is one of the best, most secured and at long term most cost efficient way for generating electrical power, without any harm to our environment and without destroying next generation´s resources. Do you think that nuclear energy is the solution of the future? Is nuclear energy a solution for our future power generation? 30 years after the Three Mile Island accident, a number of prominent scientists and politicians - including President Barack Obama - insist nuclear power must play a role if the United States wean itself from foreign oil and reduce carbon emissions. But there is a nuclear dilemma, besides the nuclear waste problem with a radioactive half-life of hundreds of years, nuclear power generation is not carbon-free - it emits about one- fourth as much pollution as coal-fired plants. 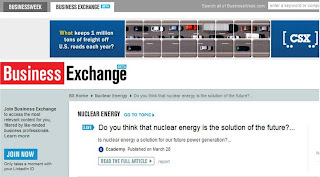 Is nuclear energy the solution of the future?